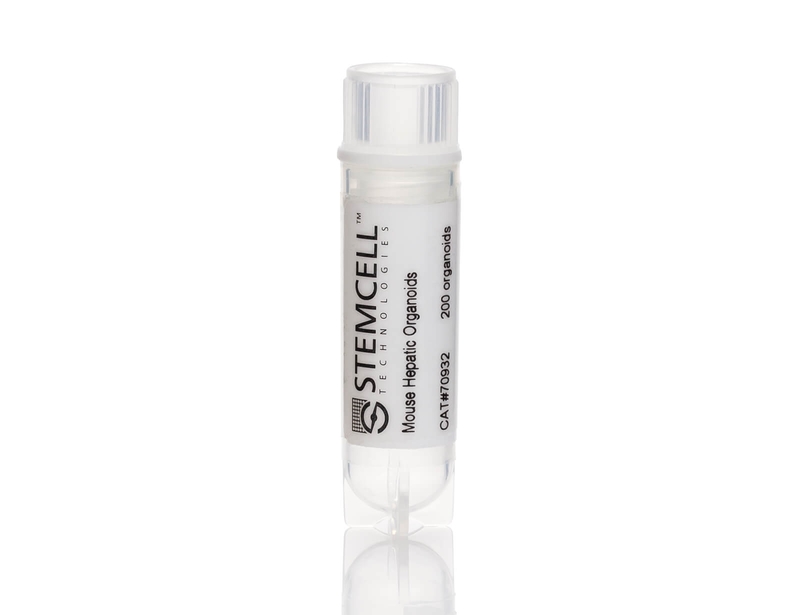 HepatiCult™ Organoid Growth Medium (Mouse) is a serum-free, defined cell culture medium for establishing and maintaining mouse hepatic progenitor organoids. These organoids, or "mini-livers", provide an in vitro culture system for studying hepatic stem and progenitor cells. 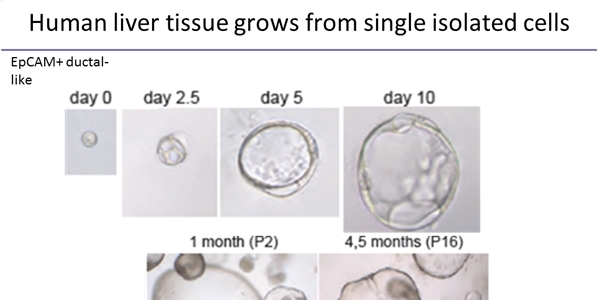 Hepatic organoids can be maintained through passaging every 4 - 7 days or cryopreserved, and are primed for downstream differentiation. HepatiCult™ supports mouse hepatic organoid culture either embedded in Corning® Matrigel® domes or in a dilute Matrigel® suspension. Growing hepatic progenitors as organoid cultures enables convenient in vitro characterization of the hepatic epithelium in a physiologically relevant system. In this webinar, Dr. Meritxell Huch discusses organoid culture and their applications in modeling the GI tract. Despite the remarkable regenerative capacity of the liver in vivo, sustained in vitro culture of liver tissues has remained difficult until recently. In 2013, Dr. Meritxell Huch et al. described a robust culture system for the maintenance of hepatic tissues as organoids. 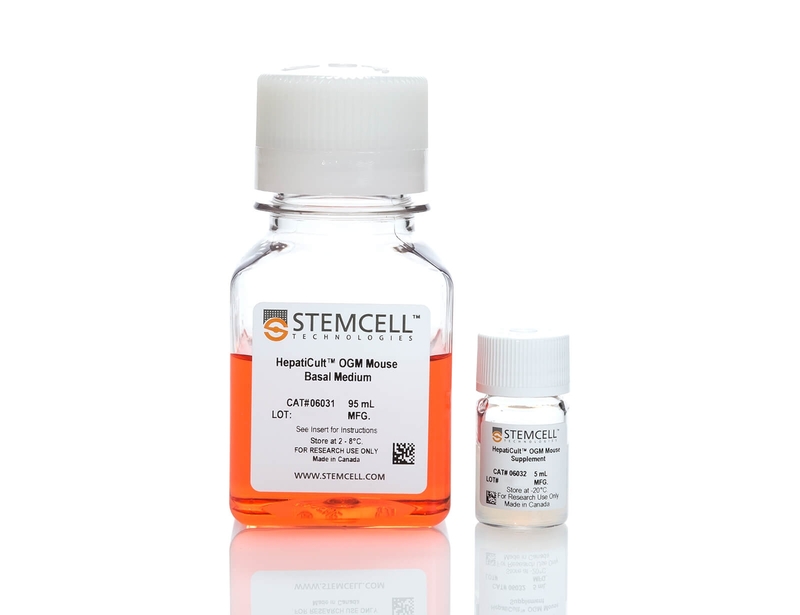 In 2014, Dr. Hans Clevers and the Foundation Hubrecht Organoid Technology signed an agreement with STEMCELL Technologies to manufacture and distribute cell culture media for organoids. HepatiCult™ Organoid Growth Medium (Mouse) was released in early 2018, providing researchers with a convenient method for establishing and maintaining hepatic progenitor organoids. Huch M, et al. (2015) Long-term culture of genome-stable bipotent stem cells from adult human liver. Cell. 160(1-2): 299-312. Huch M, et al. (2013) In vitro expansion of single Lgr5+ liver stem cells induced by Wnt-driven regeneration. Nature. 494(7436): 247-50. Kuijk EW, et al. (2016) Generation and characterization of rat liver stem cell lines and their engraftment in a rat model of liver failure. Sci Rep. 6: 22154. Nantasanti S, et al. (2015) Disease modeling and gene therapy of copper storage disease in canine hepatic organoids. Stem Cell Reports. 5(5): 895-907. Lampis A, et al. (2017) MIR21 drives resistance to Heat Shock Protein 90 inhibition in cholangiocarcinoma. Gastroenterology. S0016-5085(17): 36331-X. Broutier L, et al. (2017) Human primary liver cancer-derived organoid cultures for disease modelling and drug screening. Nat Med. 23(12): 1424-1435. Sampaziotis F, et al. (2015) Cholangiocytes derived from human induced pluripotent stem cells for disease modeling and drug validation. Nat Biotechnol. 33(8): 845-852. Dorrell C, et al. (2014) The organoid-initiating cells in mouse pancreas and liver are phenotypically and functionally similar. Stem Cell Res. 13(2): 275-83. Tarlow BD, et al. (2014) Clonal tracing of Sox9+ liver progenitors in mouse oval cell injury. Hepatology. 60(1): 278-89. Yimlamai D, et al. (2014) Hippo pathway activity influences liver cell fate. Cell. 157(6): 1324-38. Kruitwagen HS, et al. (2018) DYRK1A Is a Regulator of S-Phase Entry in Hepatic Progenitor Cells. Stem Cells Dev. Guye P, et al. (2016) Genetically engineering self-organization of human pluripotent stem cells into a liver bud-like tissue using Gata6. Nat Commun. 7: 10243. Takebe T, et al. (2017) Massive and reproducible production of liver buds entirely from human pluripotent stem cells. Cell Rep. 21(10):2661-2670. Takebe T, et al. (2014) Generation of a vascularized and functional human liver from an iPSC-derived organ bud transplant. Nat Protoc. 9(2): 396-409. Kasuya J, et al. (2015) Reconstruction of hepatic stellate cell-incorporated liver capillary structures in small hepatocyte tri-culture using microporous membranes. J Tissue Eng Regen Med. 9(3): 247-56. Takebe T, et al. (2012) Self-Organization of human hepatic organoid by recapitulating organogenesis in vitro. Transplant Proc. 44(4): 1018-20. Skardal A, et al. (2015) Liver-tumor hybrid organoids for modeling tumor growth and drug response in vitro. Ann Biomed Eng. 43(10): 2361-73.